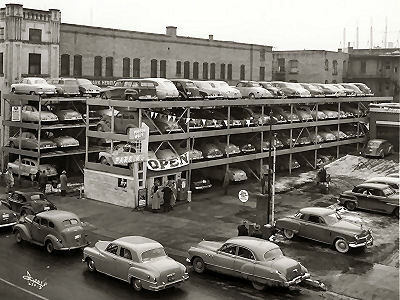 Spokane, Washington has had it's share of firsts... one of the most unique is the right to say that the first mechanical parking structure, Pigeon Hole Parking, was invented and patented in Spokane prior to 1950 by local inventors, the Sanders brothers, Vaughn and Leo. automobiles into them. 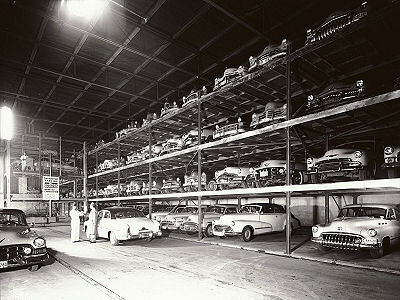 More than 110 cars could be parked in a lot only 50 feet wide, stacked like cracker boxes in the banks of "pigeon holes". 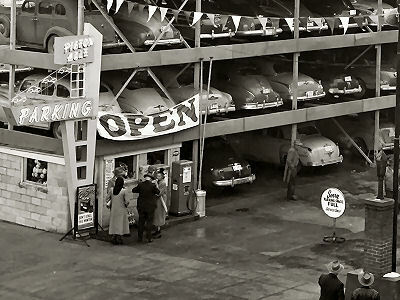 To showcase and market their invention in 1950, they constructed installations in their hometown of Spokane, like the four story parking structure located at N 22 Madison. 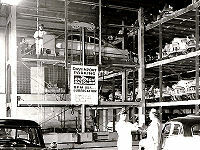 People passing by could not help but to stop and be mesmerized by the almost futuristic sight in front of them as the cars were being lifted and placed into their "pigeon hole" parking slots. Wide eyed children would often go downtown to sit and watch this amazing activity for hours on end. Northwest Museum of Arts and Culture As with most things in the 1950's service was everything and the staff didn't stop at merely parking the vehicles. They had all of the amenities you would have come to expect at a full service gas station as well. The friendly staff could also check your oil, top off your gas tank, check your tire pressure, check your battery and wash your windshield. Even when the parking stalls were full they would still operate as a full service gas station. 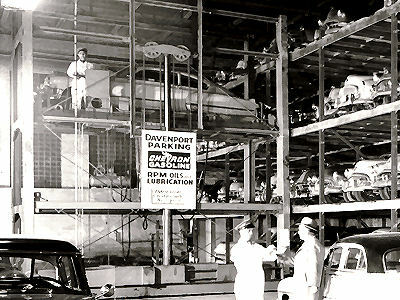 With a bit of negotiation and a little luck around 1952, they came to an agreement with the world famous Davenport Hotel to install a Pigeon Hole Parking unit in the hotel's garage, increasing the capacity of the garage immensely. This not only gave the hotel the ability to park all of their guests vehicles in far less space but it also gave the Sanders brothers their first indoor installation as well as a crown jewel to show off their invention to future buyers. Northwest Museum of Arts and Culture The Pigeon Hole Parking corporation prospered in 1950-1958 under the direction of the Sanders brothers with Vaughn serving as president and general manager and Leo as vice-president in charge of engineering. They were considered one of the leaders in the field of mechanical parking, having sold sixty units in the United States, Canada, and Venezuela. And to their credit, there are still units in operation today. 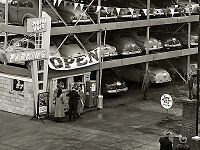 Their only competition came three years after their first 1950 installation when the Bowser Parking Systems designed by Richard Bowser, the man that engineered the curving elevator system that carries visitors to the top of the St. Louis Gateway Arch, were introduced in Iowa in 1953.